All our vets carry the equipment required to perform routine dentistry with them at all times. This includes a ‘Hausmans Gag’ and a selection of tooth rasps operated manually each with a specific action to be used on certain teeth. Should your horse require sedation for its oral examination, all the vets carry a variety of suitable sedatives. We have 2 motorised rasp kits in our practice. This allows us to carry out more advanced dentistry both in the field and in the clinic. Motorised dentistry via the use of an electric rasp with a variety of different heads can be used for specific pathological conditions and/or overgrowths. Some dental problems cannot be treated with hand rasps, such as severe overgrowths, and diastemata (gaps between the teeth) or slant mouths and Excessive Transverse Ridges (ETR). It is perhaps surprisingly well-tolerated by horses and is commonly used without the need for sedation. Routine dental care is a vital part of your horses’ management. Dental care is one of the primary aspects in preventing health conditions and can also prevent biting issues and problems when being ridden. 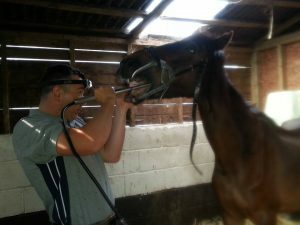 It is recommended your horses’ teeth should be routinely floated at least every year but ideally every 6 months. Horses have ‘Hypsodont Dentition’ – meaning their teeth continually erupt throughout life. Evaluation of your horses teeth can start from any age but it is often advisable to get the young colt or filly used to accepting the ‘gag’ and not seeing it as a frightening experience. This makes for a calmer experience for the horse as he or she gets older. If you have a young horse, just ask one of our vets if they have time to slip on the gag so that they begin to get used to it. Routine evaluation of your horses’ teeth provides the vet with continual information about the dentition of your horse and allows us to spot and correct any abnormalities early on. Severe overgrowths often occur on the last molars of the bottom sets of teeth and the first premolars on the upper sets of teeth. These are termed ‘hooks’. Due to the mandible (lower jaw) being narrower than the maxilla (upper jaw), it is generally accepted that excess growths occur on the inside of the lower teeth and the outside of the upper teeth. If these are not reduced then it is possible to cause cheek and tongue ulcers. Diastema are gaps that occur between the teeth. They are most commonly found between the last premolar and first two molars of the lower teeth and between the first two molars of the upper sets of teeth. However, this is not exclusive and a diastema can occur between any of the teeth. Treatment of diastema involves careful flushing and picking of the decayed material before widening the gap with a specialised head on the electric tooth rasp. The gap can then be left open or packed with a special dentine putty. Careful monitoring of the diastema in the early stages is vital to avoid the seating of infection. A change in diet is often advised as ‘short chop’ fibre feeds can predispose infection as the chop is often difficult to masticate and can get stuck in the diastema and cause the start of an infection. Wolf teeth are small additional teeth that sit just in front of the main row of molars. They often cause problems in accepting the bit, and so are frequently removed at around 5 years old. This is clearly subject to when the teeth have fully erupted. A horse may have up to four wolf teeth in total, with upper wolf teeth occurring more frequently than lower. We can perform wolf tooth extraction at your own stables. Your horse will be sedated and given ample pain relief. After removal, we normally recommend 5 days of pain relief, and a week without biting, although your vet will go through this with you on an individual horse basis.